James King grew up in Larne, Co. Antrim and has lived in Derry for twenty-five years. Since retiring from his post as Director for Community Drama at the University of Ulster in 2004 James has developed his career as performance artist and sound poet, while maintaining his interest in creative activities with vulnerable groups in the community. Much of his work is organic , spontaneous and site specific. Eg. at the Glass Box for the first Belfast International Festival of Performance Art 2013, Carrick-on-Shannon Generation festival 15th June 2013. And Catch the (H)eart Beltaine travelling residency : Galway, Wicklow, Kilkenny, 2014. 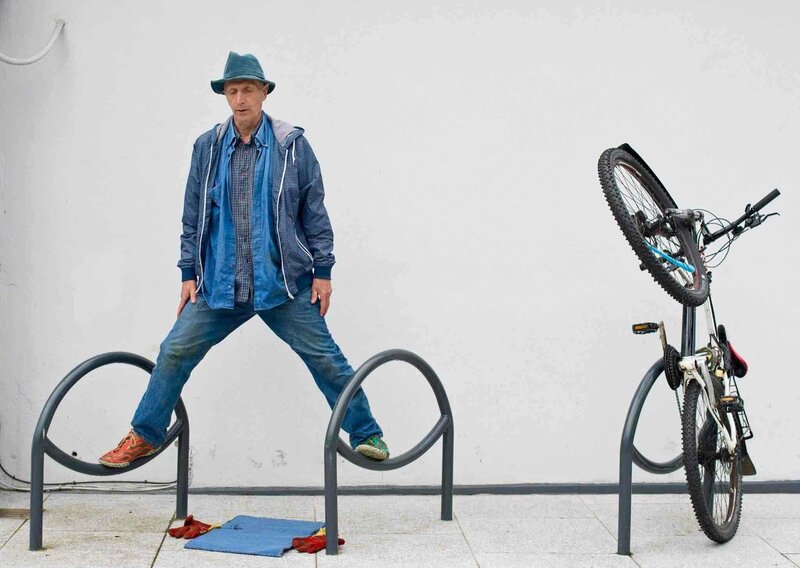 James enjoys performing in streets and public spaces, and collaborating with other individuals and groups – making weekly performances in his native Derry, including monthly group improvisations at The Social Studios and Gallery. James is a member of Bbeyond Belfast, performance art collective, and has been a regular contributor to events organised by Unit One, Dublin. He represented Bbeyond in Bergen in 2010 , Spain Bel-Mad exchange 2013 and Bel-Esse Gemany/Belgium exchange, 2014. In March 2015, James participated in the Belfast International Festival of Performance Art. He will be presenting a three day residential at the Dock Art Centre, Carriick -on – Shannon, Leitrim in April, performing at the Edinburgh Fringe in August and at Dublin Live Art Festival , July. In his performance work James is interrogating and expressing how he is in the world. His respect for intuitive spontaneity is an invitation to others to question, challenge and be liberated. Publications include “Furrowed Lives”, a self published poetry anthology with drawings by David Hegarty and ” Moving Pitches”, Yes Publications, 2008.